NASHVILLE, Tenn. – Trevecca University’s Javier Lopez and Tennessee’s Garrett Stallings were named the Player and Pitcher of the Week, respectively, by the Tennessee Sports Writers Association for their efforts in contests from April 8-14. Lopez batted .556 (10-for-18) with two home runs, 11 RBIs and 10 runs scored in five games for the Trojans. The Lawrenceville, Ga., native posted four hits with a triple, five RBIs and three runs scored in a mid-week contest, including a bases-clearing triple and a pair of RBI singles. The senior outfielder singled, was hit and scored three runs in the first of a four-game series against Davis & Elkins. He walked three times, drove in two runs and scored twice in the second game of the series. Lopez doubled, homered, drove in three runs and scored twice in the third contest versus the Senators and finished the weekend with another homer among two hits and two runs scored in the final game of the set. He is batting .361 with eight doubles, two triples, six home runs, 32 RBIs and 35 runs scored in 36 games this season. Stallings tossed a complete-game shutout against second-ranked Georgia, giving up just five hits with five strikeouts. He walked one and did not allow a runner to reach third in the series-clinching 3-0 victory for the Vols. The junior righthander worked around a single and walk in the fourth inning and induced a pair of ground ball doubleplays to end the second and seventh innings. He faced just four batters over the minimum in his first career complete game. Stallings improved to 6-2 with a 1.88 ERA and 64 strikeouts in 62.1 innings over nine starts this season. It marks the first complete game this season for a Tennessee pitcher and the first series win over a Top-5 ranked team for the Vols since 2016. 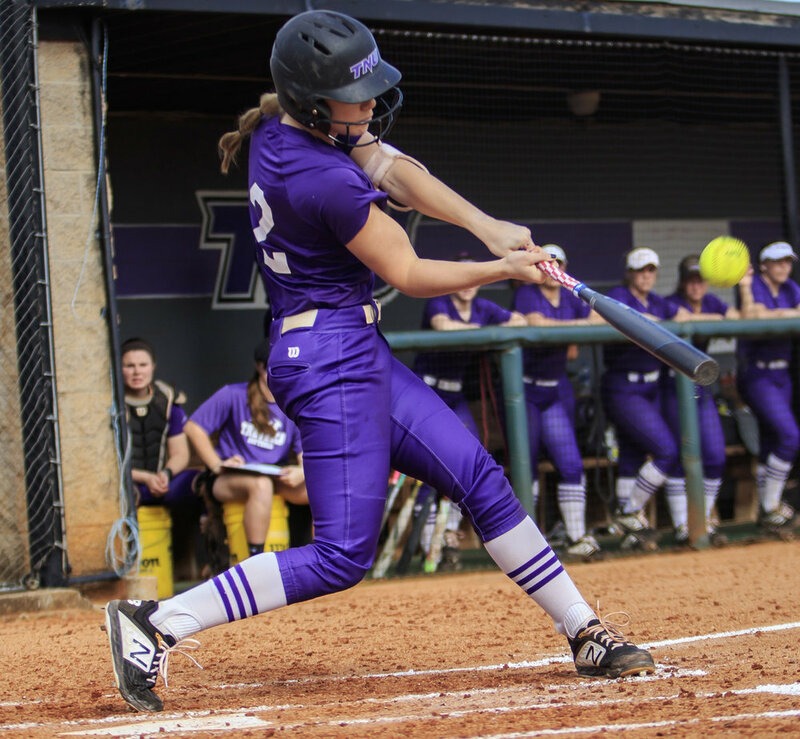 NASHVILLE, Tenn. – Trevecca University’s Kelsey Seitz and Belmont’s Alicia Veltri received Player and Pitcher of the Week accolades, respectively, from the Tennessee Sports Writers Association for their efforts in contests from April 8-14. Seitz batted .647 (11-for-17) with two doubles, four homers, nine runs scored and nine RBIs in five games for the Trojans. The Milford, Ohio, native singled and scored a run at Lee University and homered twice, driving in five runs while scoring four times in the first game of a doubleheader versus Ohio Valley University. She hit a pair of two-run home runs and singled home a run in the contest. The sophomore infielder followed that with two doubles, a solo homer and three runs scored in the second game of the twinbill versus the Fighting Scots. Seitz singled home a run and belted a solo home run in the first of two outings against Ohio Dominican and added an RBI single in the second contest versus the Panthers. She is batting .329 with seven doubles, six home runs, 18 RBIs and 21 runs scored in 34 games this season. Veltri posted three victories in three outings, all complete games, striking out 20 while allowing just three walks in conference play. The Clarksville, Tenn., native scattered 12 hits and struck out six, giving up three earned runs in a victory over Tennessee State. The sophomore lefthander followed that with a five-hit shutout versus Jacksonville State, striking out seven in the Bruins’ first win against JSU since 2015. After a leadoff single in the second inning, she retired 12 of the last 13 batters of the five-inning contest. Veltri picked up a win against Tennessee Tech to finish the week, allowing two earned runs on eight hits with six strikeouts. She improved to 12-7 with a 2.35 ERA and 120 strikeouts in 122.1 innings pitched this season covering 25 appearances. NASHVILLE, Tenn. – Middle Tennessee’s Myles Christian and Maryville College’s Jordan Davis were named the Player and Pitcher of the Week, respectively, by the Tennessee Sports Writers Association for their efforts in contests from April 1-7. Christian batted .500 (11-for-22) in four games for the Blue Raiders, posting two doubles, three home runs, nine RBIs and nine runs scored. The Olive Branch, Miss., native collected two hits and scored a run in a mid-week contest versus Murray State. The sophomore outfielder belted three home runs, including a solo homer in the second inning, a two-run shot in the fifth and a grand slam in the eighth, in the first game of a series against Western Kentucky. He doubled, drove in two runs and scored another in the second game versus the Hilltoppers and finished the second with a 4-for-5 effort with a double and three runs scored. Christian is batting .234 with six doubles, seven homers, 22 RBIs and 20 runs scored in 31 games this season. Davis tossed a complete-game shutout with nine strikeouts against William Peace University in a 3-0 Maryville win to open a three-game conference series. The Maryville, Tenn., native allowed just four hits and walked three, retiring 10-of-11 batters before the Pacers got a single and two walks in the fifth. The junior righthander struck out Jonathan Rhew to end the inning. Davis allowed just three baserunners over the final four innings to finish the shutout, upping his record to 2-3 with 53 strikeouts in 53.1 innings this season. NASHVILLE, Tenn. – Carson-Newman’s Abby Fiessinger and Bryan College’s Lindsey Dunn received Player and Pitcher of the Week accolades, respectively, from the Tennessee Sports Writers Association for their efforts in contests from April 1-7. Fiessinger batted .500 (7-for-14) with three doubles, two homers, 11 RBIs and four runs scored in four games for the Eagles. The Benton, Ky., native collected three hits with a double and two RBIs in the first of two games with Tusculum University and added an RBI double and a grand slam, scoring three times in the second contest against the Pioneers. The junior infielder hit a three-run homer in the third inning and posted a sacrifice fly in the first of two games versus Lenoir-Rhye. Fiessinger doubled and walked in the second contest with the Bears. She is batting .438 with 14 doubles, six home runs, 25 RBIs and 20 runs scored in 27 games this season. Dunn tossed two no-hitters and allowed just seven hits and three runs in 16.0 innings of work for the Lions. The Tennga, Ga., native gave up three runs on seven hits in a 3-1 loss to 23rd-ranked Tennessee Wesleyan. The junior righthander did not allow a hit, walking three and striking out two in a five-inning no-hitter against Bluefield College. She followed that with a five-inning no-hitter versus Hiwassee College, walking one. Dunn improved to 2-1 with a 2.63 ERA in 21.1 innings this season, allowing 18 hits with four strikeouts. 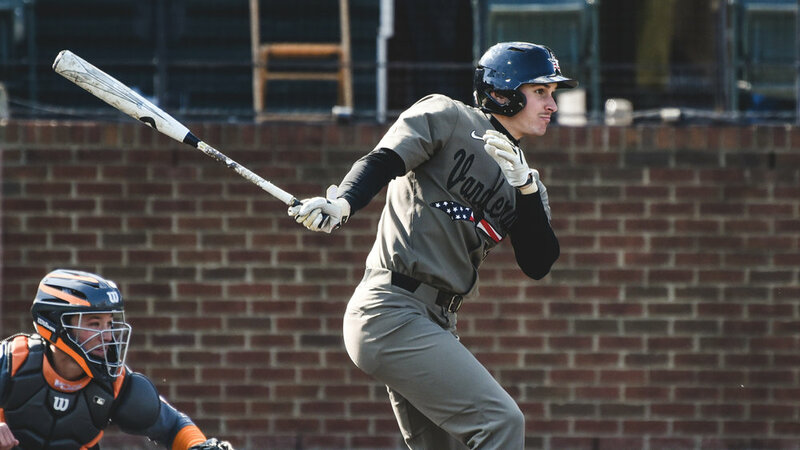 NASHVILLE, Tenn. – Vanderbilt’s JJ Bleday and Mason Hickman were named the Player and Pitcher of the Week, respectively, by the Tennessee Sports Writers Association for their efforts in contests from March 25-31. Bleday batted .375 (6-for-16) with four home runs, 10 RBIs and six runs scored in four games for the Commodores. The Panama City Beach, Fla., native belted a three-run homer in the first inning and a two-run shot in the seventh for a career-best five RBIs in a midweek victory over Lipscomb. The senior outfielder homered, walked twice, drove in two runs and scored two runs in the series opener against Tennessee and added two more hits with a two-run homer and two runs scored in the second game versus the Vols. He finished the week with an RBI single in the series finale against UT. Bleday is batting .353 with six doubles, 12 home runs, 36 RBIs and 34 runs scored in 29 games this season. Hickman tossed six shutout innings in the victory against Lipscomb, allowing just one hit with one walk and eight strikeouts. The sophomore righthander worked five no-hit frames before giving up a single in the sixth, running his scoreless streak to 23.0 innings over his last six outings, striking out 33 during that stretch. 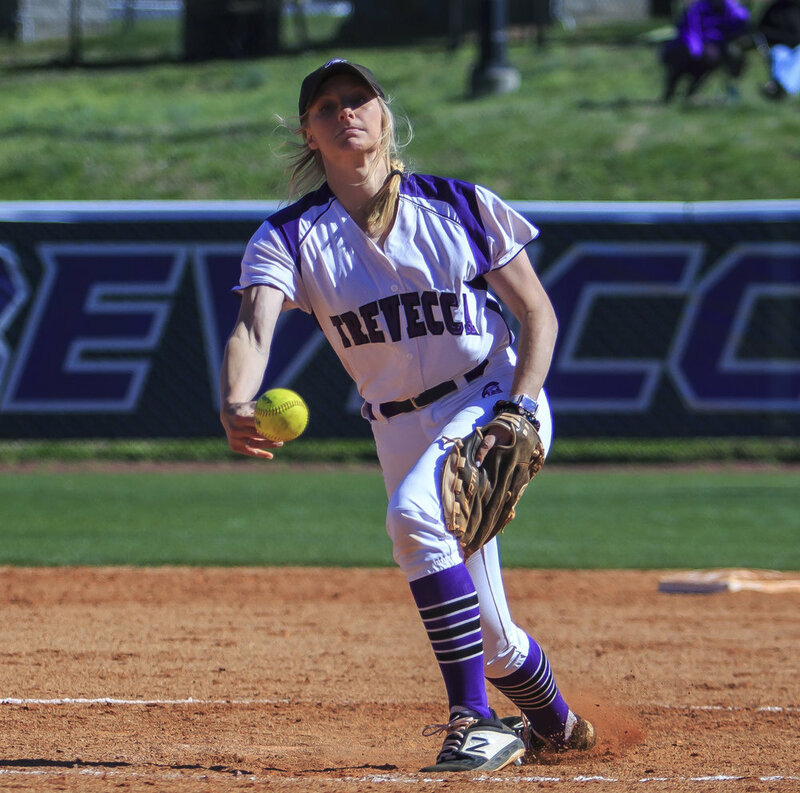 NASHVILLE, Tenn. – Trevecca University’s Tana Whited and Savannah Carr received Player and Pitcher of the Week accolades, respectively, from the Tennessee Sports Writers Association for their efforts in contests from March 25-31. Whited posted seven hits in 13 at-bats (.538) with a double, seven RBIs and two runs scored in four games for the Trojans. The Lebanon, Tenn., native drove in a run in the first contest and collected two hits with a run scored in the second game versus Christian Brothers. The junior outfielder was 3-for-4 with two RBIs and a run scored in the first outing against Tiffin University. She added two hits with a double and four RBIs in the second game versus the Dragons. Whited is batting .343 with seven doubles, six home runs, 35 RBIs and 14 runs scored in 31 contests this season. Carr recorded two victories in the circle for the Trojans, allowing one earned runs with four strikeouts in 10.1 innings. The Springfield, Tenn., native tossed 5.1 innings in a victory against Christian Brothers, giving up one earned run on four hits with one strikeout. The senior righthander followed that with a five-hit shutout versus Tiffin, allowing two hits with three strikeouts. She improved to 9-4 with a 2.77 ERA in 16 appearances over 73.1 innings this season, striking out 55. March 6 – Danielle Liermann, Austin Peay (Player); Alyssa Arden, Tennessee Tech (Pitcher)"
NASHVILLE, Tenn. – Vanderbilt’s Stephen Scott and Drake Fellows were named the Player and Pitcher of the Week, respectively, by the Tennessee Sports Writers Association for their efforts in contests from March 18-24. Scott batted .571 (8-for-14) with two home runs, six RBIs and nine runs scored in four victories for the Commodores. The Cary, N.C., native posted two hits with a double, a solo homer, a walk and three runs scored in a 3-0 win over Belmont. He drove in a run when he was hit with the bases loaded in Thursday’s 5-0 victory against Florida. The senior outfielder was 4-for-4 with a double, a walk and three runs scored in the second game versus the Gators and collected two hits with a double and a grand slam, scoring three times in the series finale. Scott is batting .391 with 10 doubles, three home runs, 24 RBIs and 27 runs scored in 24 games this season. Fellows tossed a five-hit shutout against Florida in the series opener, allowing three walks with eight strikeouts in a 5-0 win. The Plainfield, Ill., native posted just one 1-2-3 inning in the contest, working around an error and a walk in the fourth inning and at least one baserunner in every frame but the seventh. The junior righthander improved to 5-0 with a 3.68 ERA in six appearances this season covering 36.2 innings, giving up 29 hits with 48 strikeouts. Opponents are batting just .216 against him. NASHVILLE, Tenn. – Tennessee Wesleyan’s Baylee Sutton and King University’s Casey Gilbert received Player and Pitcher of the Week accolades, respectively, from the Tennessee Sports Writers Association for their efforts in contests from March 18-24. Sutton batted .588 (10-for-17) with three home runs, 13 RBIs and five runs scored in four games for the Bulldogs. The Crandall, Ga., native collected three hits with a run scored and four RBIs in the first game of a doubleheader against Reinhardt University and added two hits with a run scored in the second contest versus the Eagles. The senior infielder homered among her three hits and drove in five runs in the first game of a twinbill at Montreat College. She hit two home runs and drove in four runs in the second contest against the Cavaliers. Sutton is batting .492 with four doubles, four homers, 30 RBIs and 23 runs scored in 18 games this season. Gilbert posted four victories in the circle in five appearances for the Tornado, allowing just one earned runs on 17 hits with 15 strikeouts. The Hendersonville, N.C., native worked six shutout innings, giving up five hits with five strikeouts versus Mars Hill University. The junior tossed three shutout frames in relief for a win in a 4-3 victory against UVA-Wise, allowing two hits with three strikeouts. She gave up one earned run on one hit in one-third of an inning in the second game versus the Cavaliers. The righthander pitched seven shutout innings in a win at Barton College, giving up five hits with five strikeouts, and ended the week with a four-hit shutout at the University of Mount Olive, striking out two. She walked just four batters in her 23.1 innings over the five appearances as well. Gilbert posts a 6-3 mark with a 1.17 ERA in 13 appearances covering 59.2 innings this season. She has allowed 49 hits with nine walks and 33 strikeouts, with opponents batting just .217 against her. NASHVILLE, Tenn. – Trevecca University’s Javier Lopez and Tusculum University’s Charles Hall were named the Player and Pitcher of the Week, respectively, by the Tennessee Sports Writers Association for their efforts in contests from March 11-17. Lopez batted .588 (10-for-17) in four games against Malone University, recording four doubles, two home runs, eight RBIs and nine runs scored. The Lawrenceville, Ga., native posted two hits with a double, a homer and two RBIs in the opener and was 3-for-3 with a home run, five RBIs and two runs scored in the second game of the doubleheader. The senior netted three more hits with a double and two runs scored in the third game of the series and finished with weekend with two doubles, two RBIs and three runs scored. Lopez is batting .388 this season with five doubles, two home runs, 12 RBIs and 16 runs scored in 18 games. Hall broke the NCAA Division II single-game record for strikeouts, fanning 22 batters in a complete-game victory against Queens University. The Dumfries, Va., native struck out every Royals batter at least once, including eight of the nine Queens' hitters at least two times each. The senior righthander recorded two strikeouts in every inning and fanned the side four times, including the first, second, fifth and sixth innings. Sixteen of the strikeouts were swinging while six were looking. Hall leads the nation with his 88 strikeouts this season and has posted 10 or more batters in six consecutive starts. He broke the national mark previously held by five other pitchers, with the most recent coming on April 1, 1999, when Nate Kosoc of Saint Rose fanned 21 batters against NJIT. Hall's 22-strikeout effort is ranked seventh for all NCAA Divisions. He surpassed the Tusculum single-game record of 17 strikeouts posted by Placido Torres, who achieved the feat against Stillman University. Hall also bested the South Atlantic Conference record of 19 established by former Wingate University hurler Danny Lampley, who did it twice in the 1998 season. NASHVILLE, Tenn. – Union University’s Kaitlyn Kelley and Austin Peay’s Morgan Rackel received Player and Pitcher of the Week accolades, respectively, from the Tennessee Sports Writers Association for their efforts in contests from March 11-17. Kelley batted .500 (8-for-16) in five outings with two doubles, one home run, five runs scored and 10 RBIs for the Bulldogs. The Lexington, Tenn., native drove in a run with a sacrifice fly in the first game of a doubleheader against Illinois-Springfield and collected a double, a homer, two runs scored and six RBIs in the second game versus UIS, hitting a walk-off grand slam versus the Prairie Stars. The freshman infielder recorded two hits with two walks, scoring once and driving in a run in the first game of a series against Montevallo and was 3-for-4 with a double, two RBIs and two runs scored in the second contest versus the Falcons. Kelley is batting .453 with 12 doubles, eight home runs, 40 RBIs and 35 runs scored in 31 games this season. Rackel tallied a 3-0 record with a 0.67 ERA with three complete-game victories for the Govs. The senior allowed one run on three hits with 10 strikeouts in a 4-1 victory against Miami University, with APSU scoring a pair of insurance runs in the top of the seventh. The Calgary, Alberta, native tossed a five-hit shutout in a 5-0 win versus Dayton, her fourth shutout of the season, gave up five hits with one walk and seven strikeouts against the Flyers. She followed that with seven innings in a 5-2 victory versus Michigan State, allowing one earned run on five hits. She walked three and struck out six. Rackel improved to 11-5 with a 1.15 ERA in 17 appearances in 102.2 innings, striking out 114.